After you've completed writing your digital information product, it's time to put it in a format that can be downloaded from the Internet and utilized by your customer. PDF is the de facto standard format for electronic products. After you've completed writing your digital information product, it's time to put it in a format that can be downloaded from the Internet and utilized by your customer. You could distribute your product in plain text or in Microsoft Word (.doc) format, but these format's permit anyone to easily edit your work and turn it into their own product. You need to "compile" your writing into a format that can't be easily edited. By law, the moment you publish your product, it will have a copyright, and then it will be illegal for anyone to copy your work and turn it into their own product. Places like China and Nigeria don't recognize copyright law. Having a compiled product cannot totally prevent someone from stealing your work. If someone really wants to copy your product, they can just sit down and retype the entire thing, and China and Nigeria have plenty of cheap labor for retyping things. But the best way you can protect your work is to compile it. There are many different formats into which you can compile your product. Microsoft Reader and Palm Reader are two popular formats. But these formats are device specific. 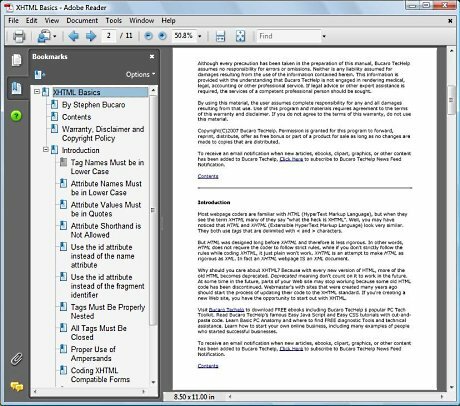 Adobe PDF format (Portable Document Format) is a cross-platform format that will work on Macintosh, Windows, Linux, and many other operating systems. PDF is the de facto standard format for electronic products. The reason for its popularity is that its been around for many years and anyone can download the appropriate Adobe Reader for their system for free. PDF files are usually created and compiled with Adobe Acrobat. You can compile your file for free at the Adobe Acrobat Web site. At the Web site you can also download a free trial of Adobe Acrobat. There are many other freeware and shareware products available, along with many other Web sites, where you can compile your product into PDF format. Be aware that most of these products and Web sites are not capable of creating active links in the PDF document. In your digital information product, you might want links to resources on the Internet, or links to your other products that you sell online. If you use Adobe Acrobat to compile your file, it can have active links, password protection and many other advanced features. Password protection can be used to prevent people from making illegal copies of your product. When a customer downloads your product, they also receive a password required to open the file. Of course there's nothing to prevent someone from sharing the password along with your product.